This Kit comes with a choice Size of Locking Nut. R2 or R3. If you need something different let us know we will get it. Also the Nut is Black, not Black Satin at the time of this add. ( Floyd Rose is out of stock on them for now ) However you can hardly tell, the black nut looks great with the Black Satin Bridge. Used by more professionals throughout the world than any other. No copy can duplicate the double-locking design of the Floyd Rose Tremolo System that allows you to lock your guitar in tune at the nut and at the bridge. The Floyd Rose Tremolo System is engineered like no other tremolo system. Its high quality steel parts are precision-made in Germany to exacting specifications, and it's available in a variety of nut sizes that will fit practically any electric guitar. 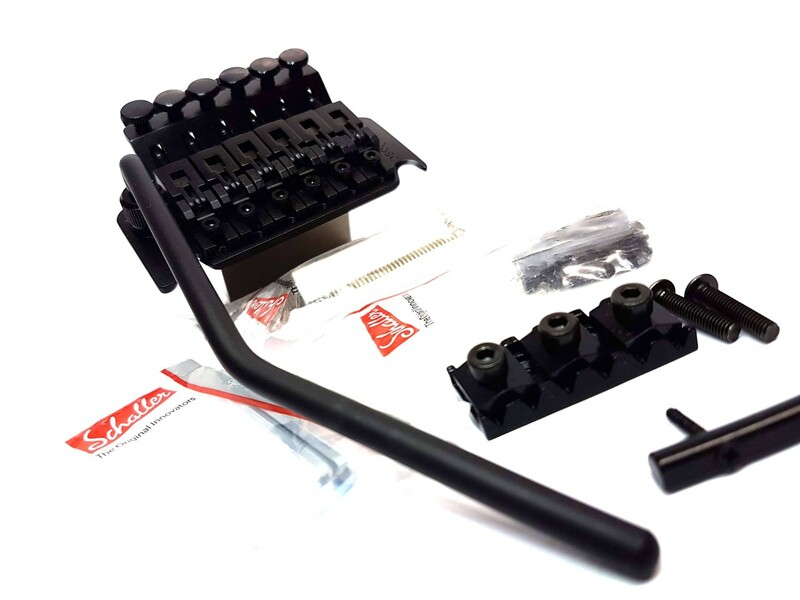 The tremolo kit contains the bridge, locking nut, springs & claw, mounting studs, and all hardware necessary for installation.